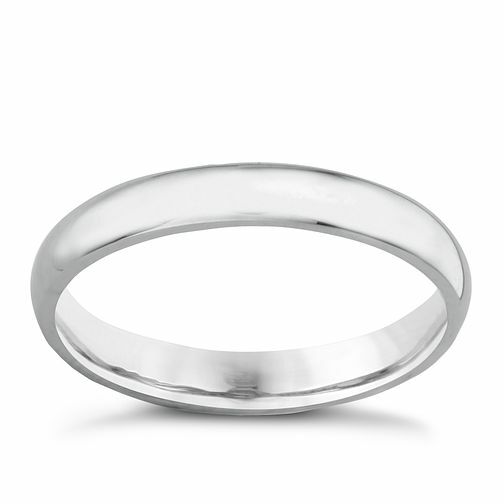 This extra heavy weight court wedding band is made from luxurious 18ct white gold and is a slim 3mm in width. A stylish accessory designed to mark the start of your new chapter. 18ct white gold 3mm extra heavyweight court ring is rated 4.8 out of 5 by 10. Rated 3 out of 5 by Anonymous from Not heavy at all If you want a heavier ring I would recommend the super heavy ring as this still feels too lightweight This was for a wedding and I was super disappointed with it but the replacement was super heavy weight 5mm and we were both happy with it. Rated 5 out of 5 by Anonymous from Lovely wedding band, goes so well with diamond engagement ring This wedding band sits comfortably on your finger, feminine but with a good weight. The staff at The Watford branch were great!